OK I know it has been a long time since I have posted and I was doing so good at keeping up! My only excuse is that the exhaustion and nausea are really getting to me and it is hard for me to keep up with normal daily activities and chores! I am praying that this part of pregnancy will be over soon, but in reality, I probably have another month of it at least. Pray for relief! 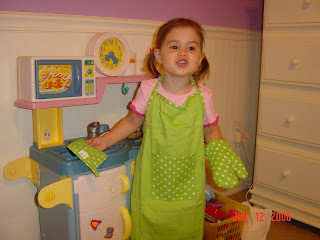 Anyway, here is my little Chef Avery after I found an apron, oven mitt, and hot pad set that all matched. She was particularly excited about the oven mitt! Just like Mommy's! !